For all you movie fans in Los Angeles, join us next week for a special screening of 1993's The Joy Luck Club, kicking off a new film series called "Big Trouble in Little Tokyo," presented by the Japanese American National Museum in partnership with Angry Asian Man, First Pond Entertainment and Visual Communications. It's happening Wednesday, January 11 at the Japanese American National Museum in Little Tokyo. The evening will begin with a light reception at 6:00pm, followed by the screening at 7:00pm, and a Q&A with director Wayne Wang and additional panelists (to be determined). 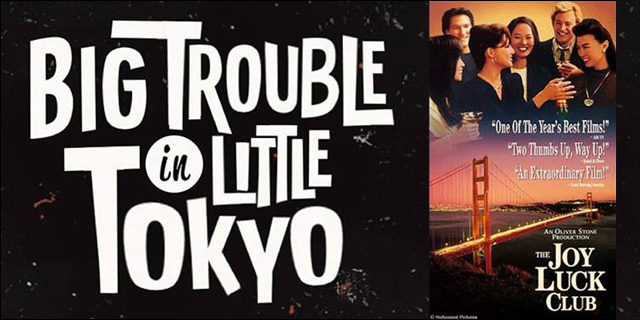 Big Trouble in Little Tokyo presents "The Joy Luck Club"
In this 1993 film adaptation of Amy Tan’s bestselling novel, a Chinese American daughter is asked to take her late mother’s place at a weekly mahjong game, where a group of immigrant women have been gathering to share their stories since immigrating to the United States following World War II. Having only a passing interest in her heritage at first, June eventually learns, along with the daughters of the three other mahjong players, to appreciate the struggles endured by the previous generation. Directed by Wayne Wang and starring Ming-Na Wen, Tamlyn Tomita, Lauren Tom, and Rosalind Chao. Rated R.
The evening will begin with a light reception at 6 p.m., followed by the screening at 7 p.m. and a Q&A with director Wayne Wang and additional panelists TBD. At the door: $12 JANM and VC members, $15 general. For further information about the screening, refer to Facebook.